There are so many different types of alcohol that can easily be fermented at home. 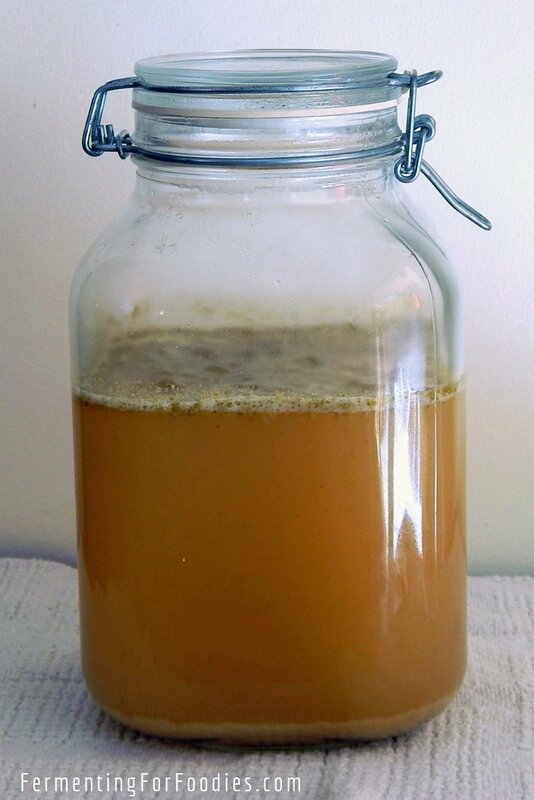 Sourdough kvass is the EASIEST homemade alcoholic beverage. It doesn’t require any special ingredients or equipment to create a sweet and sparkling drink. Though there are a lot of vegetable kvass recipes, however, traditional sourdough kvass is made from sourdough bread. It has long history of being brewed at home in Eastern Europe. 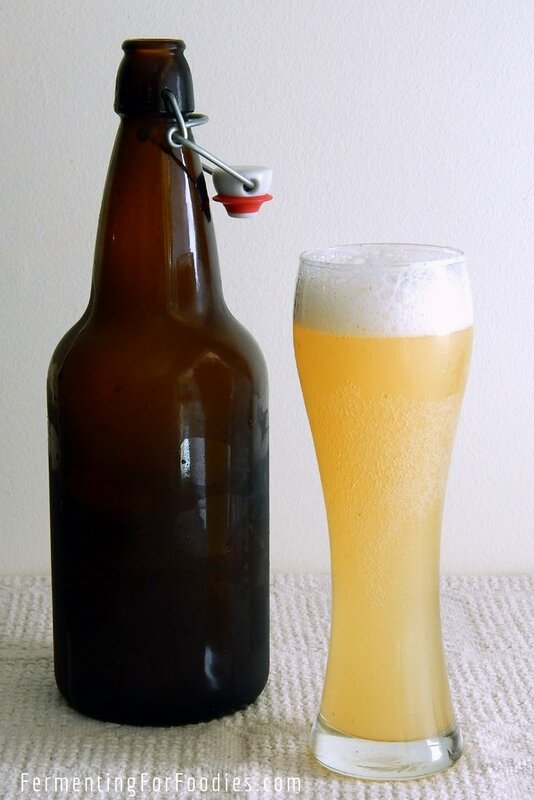 It is likely the original form of beer as it is very easy to brew at home and doesn’t require any special ingredients. All you need to do to make bread kvass is toast a loaf of bread, then soak it in water to extract the malted sugars. Then strain the liquid and ferment it with sugar, yeast and additional flavours. In the photo below, I have used hops for a beer-like flavour. However, there are plenty of different flavour options. See the bottom of the post for more ideas. Cut the bread into cubes and toast it in the oven at 350 F for 20 min. tossing halfway through. The goal is to caramelize the sugars, so toast as long as necessary. Combine 3 liters of boiling water with the dried bread in a bowl and let it soak for at least 4 hours (up to 24 hours). The goal is to extract the malted sugars into the boiling water. 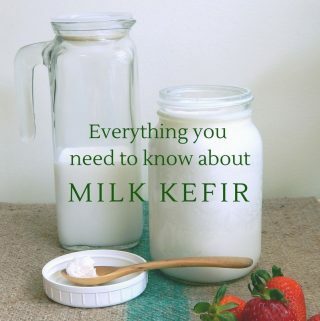 Strain liquid into a fermentation container and add in your chosen flavour, sugar and yeast. Leave it in a warm location to ferment for around 1 week. It will start to foam significantly after 6-12 hours. 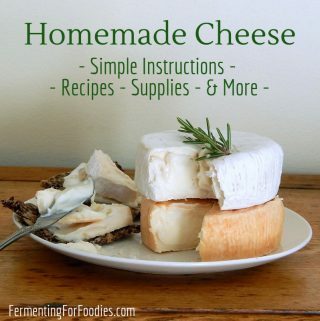 After one week, strain the kvass through a cheese cloth into bottles (see notes) and store in the fridge. The kvass will continue to ferment and will build up pressure, so use appropriate containers, and release the pressure every few day until is stops building up carbonation. It will be ready to drink after 3 days in the fridge. However, it will continue to ferment for another 1-2 weeks until all the sugars have been consumed by the yeast. At that point it will no longer be sweet and it will have reached it's full alcohol content. Using sourdough starter will only result in 0.5%-2% alcohol. If you use bread yeast it could ferment up to 8% alcohol. 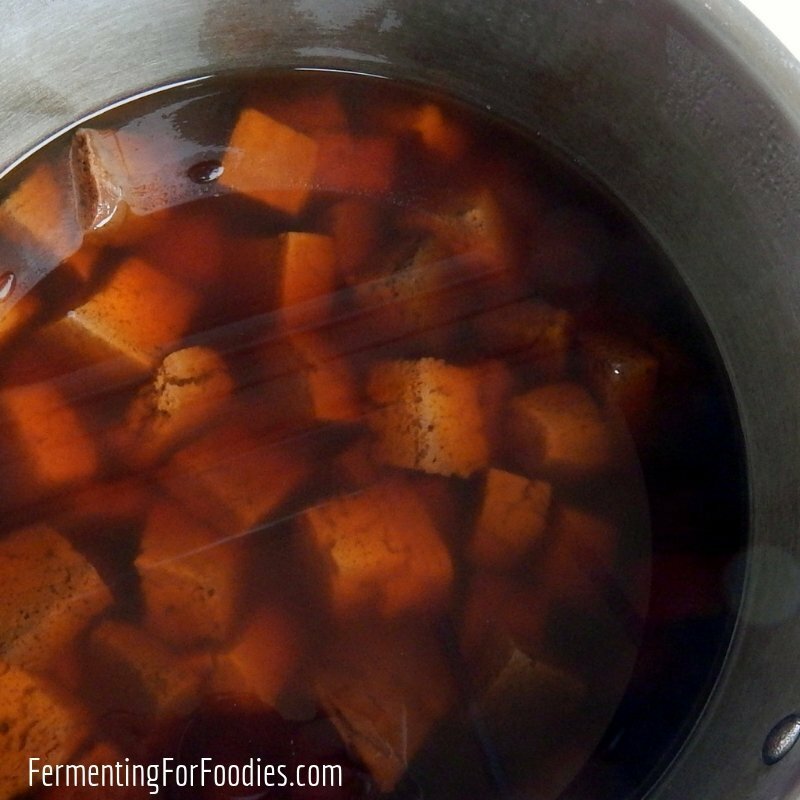 If you plan on drinking your kvass within 2 weeks of making it, you probably don’t need to worry about sterilization. However, if you are keeping it any longer than that, I recommend sterilizing EVERYTHING and using airlocks for the initial ferment. It’s the best way to prevent your kvass from spoiling. or swing-top beer bottles for bottling. Both will be able to handle the build up of carbonation. However, you should still check the bottles for the first few days in the fridge, as it can build up a significant amount of carbonation. Sourdough Starter: I have made kvass with bread yeast and sourdough starter. 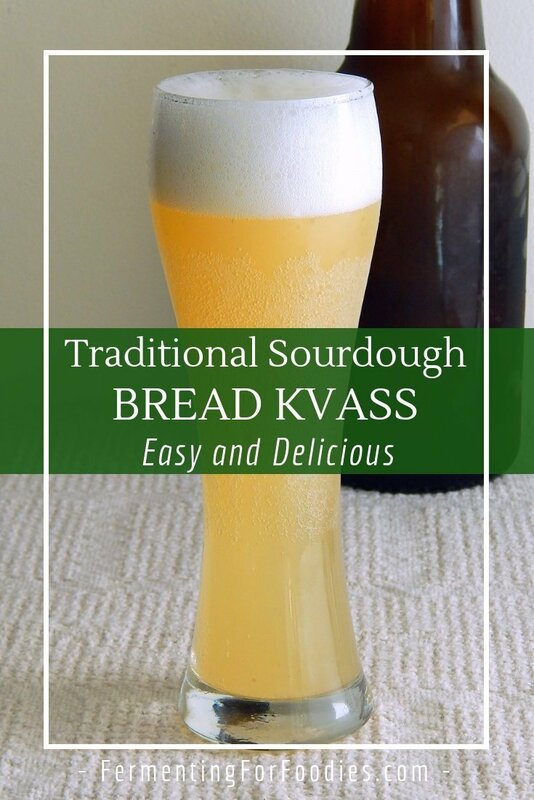 When using sourdough starter, your kvass may have an unpleasant, yeasty smell during the initial stages of fermentation. 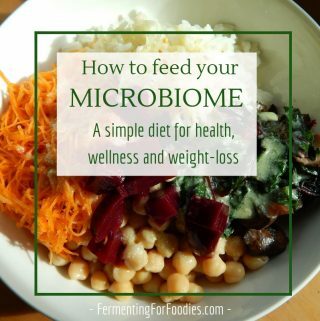 This is part of using a free-range yeast and bacteria culture. However, this smell and flavour will improve after a week in the fridge. Type of Bread: Though rye is the traditional bread for sourdough kvass, any kind of bread will work. Personally I like the caramelly flavour that comes from a nice loaf of dark rye. A loaf of white bread will result in a lighter beverage that is refreshing on a hot day. Added Flavours: Mint is the traditional flavour. Use a few sprigs of mint for a batch. Adding a handful of raisin, berries or a few slices of apples will give the kvass a fruity flavour. Lemon peel is refreshing. Hops: Adding 1 tbsp of hops will give your kvass a beer-like flavour. It also acts as a preservative, improving the longevity of your kvass. Here is kvass made from a loaf of light rye. Just tried my sourdough kvass last night after waiting patiently for two weeks! It was really good. I could taste the mint and orange peel coming through quite nicely, but otherwise the flavour was almost like cider – light and slightly sweet. So cool to have made my own drink with nothing but some sourdough bread, sugar, yeast! Thanks for the recipe. I’m glad it worked out for you! It is fun to make a quick and easy alcoholic beverage. How long did you wait? My husband makes sourdough rye all the time… but it takes a really long time to catch the culture. Like 5 days? Buckwheat starts really quick (2 days). I think it’s just the way the culture works. Also, if it was your first time fermenting sourdough, there might not be a very strong culture in your house. But if you start to do it regularly, it should get quicker to catch. I’m glad it worked with yeast!